coach to teach students to save money. Whether it is running to get in better physical shape or saving money to get in better financial shape, motivation and a lack of realistic goals can lead people to give up. But not if Mary Kerwin, who coached high school cross-country for over a decade in the Plymouth-Canton school district, is around. Last year a colleague, Helen Miller-Padden, sought Mary’s help in training for a 5k race.. They agreed to meet once a week at 7 a.m. to run. However, before they started, Helen offered Mary her cell number in case she couldn’t make it as scheduled. Some might call that tough love, but it worked for Kerwin and her trainee as they ran every week and Miller-Padden went on to complete her first 5k race. Throughout her coaching career, Kerwin achieved success by preaching planning, setting achievable goals and taking measured steps to achieve those goals. Kerwin also works at Community Financial as an Educational Partnership Coordinator with the student-run credit union program that helps students learn good financial habits early in life. And Kerwin knows, just like training to run a 5K or a marathon, saving money is about setting achievable goals and taking the steps necessary to reach them. 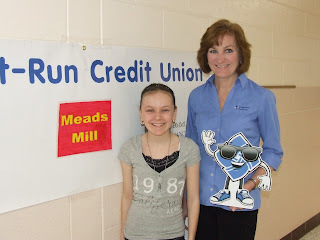 To learn more about the student run credit unions, click here. To speak with one of our Community Financial team members on how to develop plans for other financial goals, visit http://www.cfcu.org.